How to Digitize Blu-ray Collection for Better Storage and Playing? - Physical Blu-ray disc takes a lot of space of your room shelf, in addition, it would be take a long time for you to pick your unwanted disc. - Physcial Blu-ray disc can easily get damaged or scratched, it would be essential to backup Blu-ray to digital formats for a safe backup. - It would be a great burden for you to take them all especially when you are travelling, it would be much more convenient for you to digitize Blu-ray into media formats for storing on external portable drive for viewing on smartphone, tablets or computer when travelling. What you will need to digitize Blu-ray collection? This is pretty obvious; you won't get far if your computer can't read Blu-Ray discs. You can get them for as low as $60 now on Newegg if don't already have one. Blu-ray are very big, A Blu-ray disc can hold up to 25GB on a single-layer disc and 50GB on a dual-layer disc. And the capacity of the hard drive depends on the Blu-ray movies you're ripping and the quality you want in the final movie file. An external hard drive from 30 to 60GB will work just fine. If you have large collection of Blu-ray disc for ripping, then you can use this handy dandy equation: number of blu-rays x 27= total amount of GB of hard drive space you'll need. - A full disc copy of Blu-ray in original structure with no quality loss. 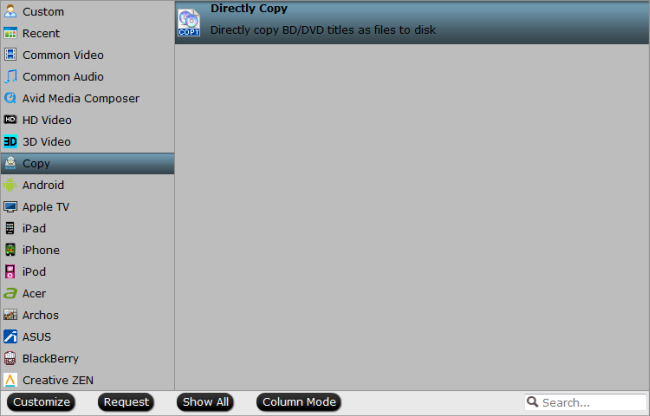 - A fast main movie copy of Blu-ray without unwanted ads, trailer, comments, reviews, warning and titbits, etc. 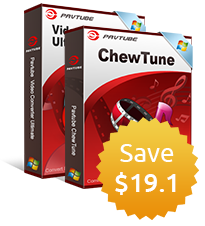 - Lossless digital copy of Blu-ray in Multi-track MKV format with your desired subtitle languages, audio tracks well preserved for playing on WD TV or JRiver Media Center. - Rip Blu-ray to popular digital file formats such as MP4, MKV, MOV, AVI, WMV for better viewing on media players or portable devices. - Directly output Blu-ray to various popular devices such as iPhone, iPad, Android Phone or tablets, Windows Phone/tablets, game consoles, TVs, TV-Set boxes, etc preset profile formats with the optimal playback settings. 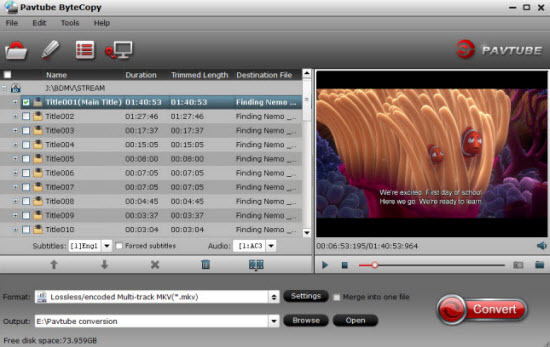 - Create 3D movie with SBS/TAB/Anaglyph mode from 2D/3D Blu-ray disc with the format of MP4/MKV/MOV/AVI/WMV for playing on VR Headsets, 3D TV or 3D video player apps. This cross-platform application is available on both Windows and Mac, you can download the Mac verison - Pavtube ByteCopy for Mac to digitize Blu-ray collection on Mac OS X El Capitan or macOS Sierra. 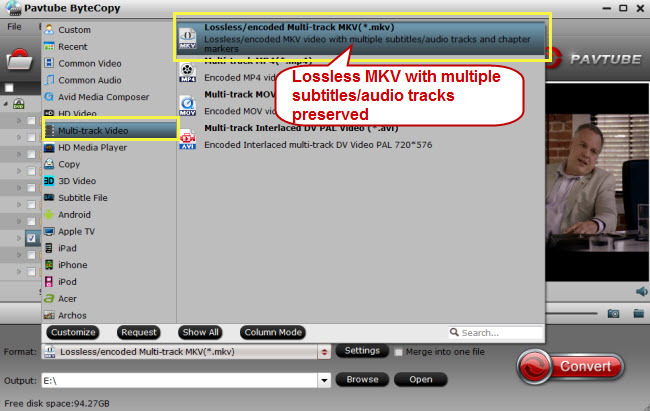 Get a complete MKV output from Blu-ray/DVD by following "Multi-track Video" > "Lossless/encoded Multi-track MKV(*.mkv)" with all the subtitle languages and audio tracks. Tips: Click "Settings" on the main interface to open "Multi-task Settings" window, all audio tracks from the source files are checked and to be saved in the output MKV container by default, if there are some audio tracks you don't like, uncheck and remove them under the "Audio" tab. Step 3: Begin the Blu-ray digitizing process. After finishing all the settings, go back to the main interface, press the right-bottom "Convert" button to start Blu-ray to your desired digital file format conversion process. When the conversion is completed, click "Open output folder", a window will pop out with all your converted files. You will then be able to copy the converted Blu-ray files to external hard drive or transfer and view on different portable devices.